Hope springs eternal is a refreshing facial spray designed to give you ultimate hydration and good-for-your-skin ingredients in one quick spritz. Anyone looking for the ultimate skin hydrator. - Why is it different? 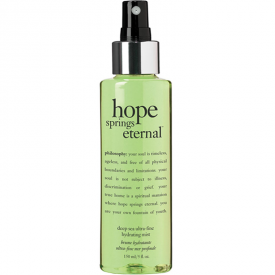 Hope springs eternal is an ultra-fine, hydrating mist that helps replenish skin's moisture level to revitalize and restore skin, while enhancing your sense of well-being with a fresh, invigorating scent. Formulated with rejuvenating properties of the deep sea, hope springs eternal topically feeds your skin healthy nutrients for a healthy glow. This instant skin pick-me-up is infused with hyaluronic acid to bathe the skin in hydration. We suggest that you use this several times a day to maintain a gorgeous, timeless complexion. Hold bottle 10-12" from face. close eyes, and spray. Can be used after cleanser, before treatment and moisturizer to add a boost of hydration. Can also be used after makeup application to set makeup. Sea water/maris aqua/eau de mer, polysorbate 20, propanediol, fragrance/parfum, sodium hyaluronate, potassium sorbate, beta-glucan, rhizobian gum, glycerin, sodium benzoate, citric acid, hydroxymethylpentyl 3-cyclohexenecarboxaldehyde, limonene, linalool, citral, coumarin, hydroxyisohexyl 3-cyclohexene carboxaldehyde, methylisothiazolinone. I had a sample size of this spray and the packaging may differ from the full sized version. The mist comes in a light plastic container with an atomiser cap to dispense the product. The spay jet was very powerful on trying and the coverage quite restricted, making several squirts necessary to cover the face. As the jet was very strong, it was a little shock each time it was pressed, not a relaxing experience. The product itself has a lightly floral fragrance which is quite pleasurable. The product is cooling and refreshing on the face and assists in hydrating skin in combination with other skincare products. The product is more expensive than some family brands of similar product, but it is available at outlets such as Boots and department stores. Facial mists are a rarity for me in my beauty regime and until now I have often found that they have little or no benefit for my skin….this was until I found this little gem by Philosophy! I received a small sample of the Hope Springs Eternal Facial mist as part of a sample pack of their ‘Hope Range’. Upon reading the ingredients this product claims to contain hyaluronic acid which is an excellent and high performance hydrator and sea minerals, also of great nourishing benefits for the skin. I noted that this product is designed for dehydrated skins so was excited to put it to the test. 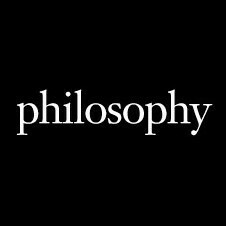 The mist is housed in a pump spray bottle with a little ‘philosophy’ printed on the front, conducive to the product within. As per the instructions this product can be used to refresh the complexion throughout the day whilst re-hydrating it for a moisture boost. To apply you should hold the spray 10-12 inches from the face and with closed eyes, you should mist your skin. As this was a sample size I am unsure how the full product bottle would compare but I did find the pump action mist a little too powerful to make the application pleasurable. The mist did not seem to have a wide enough spread to mist the whole face at once so on this application side it was a little ‘hit and miss’. Once I spritzed my face I was very pleasantly surprised at the instantaneous cooling and freshening effect on my face. Refreshing is the key word here and my skin felt instantly fresh, cool and comforted. The fragrance is barely there but very pleasant. I kind of floral fresh that is uplifting and enlivening. The product dries almost immediately without leaving any trace of residue or stickiness on the skin and perhaps the most pleasant aspect of the product is that it does indeed give your skin an instant and noticeable boost of hydration! It is also suggested that this product can be used for ‘setting’ your makeup after application. If you makeup is prone to cracking during the, as mine is prone to do, this mist does indeed refresh the look of your makeup and prevents that dry, dehydrated look that your complexion can take on later in the day. For me, there are no particular progressive benefits to constant usage of this product however it is a little handbag gem for anytime throughout the day that your skin feels jaded, dry or dull. One spritz of this mist gives an instant refreshing boost to the skin and I think it would make an amazing travel companion to hotter climbs. Whilst the price tag is not enormous in comparison to some other brands I feel that I would be willing to make a full size purchase especially for travel purposes. I would not class this as a treatment product per se however as a refreshing boost to those that travel and work in air conditioned environments this could be a real gem of a purchase! Light refreshing mist with hyaluronic acid and sea minerals. Long lasting and instantly hydrating. Helps to refresh makeup and dehydrated skins. A very addictive and refreshing facial mist that instantly cools, rehydrates and refreshes the complexion. - A very slight moisturising effect. - Doesn't really hydrate the skin that much. - The mist isn't that fine. A refreshing facial mist that has a very slight moisturising effect.